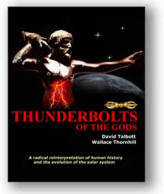 Meteors sometimes detonate with forces approaching a nuclear blast as they flash through the atmosphere. Is it friction? Or does electricity play a role? In past Thunderbolts Picture of the Day articles, we have written that many features found on Mars could be the result of electrical scarring. 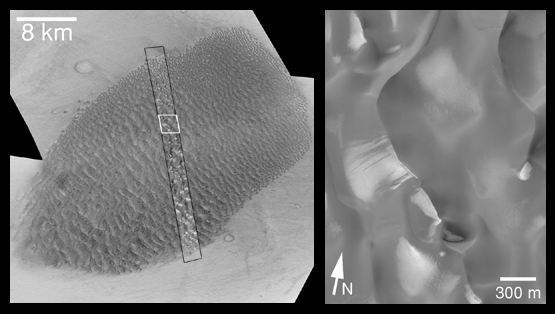 The source of the titanic thunderbolts that have excavated billions of tons of material from Mars remains inconclusive, but the discharging of electric arcs from above the surface appears to be the mechanism by which formations like the "dunes" of Proctor crater in the left-hand image are created. Because the Proctor crater "dune field" is approximately 50 kilometers long and 20 kilometers wide, the fact that it resembles the Sikhote-Alin meteorite is extraordinary. Since the Proctor crater formations are immobile structures that have not changed shape in five or more years of observation, it suggests that they are not wind-blown sand or dust. In fact, the solidity of the surface is remarkable, with large boulders and acres of pebbles scattered among the 800 meter high slopes. 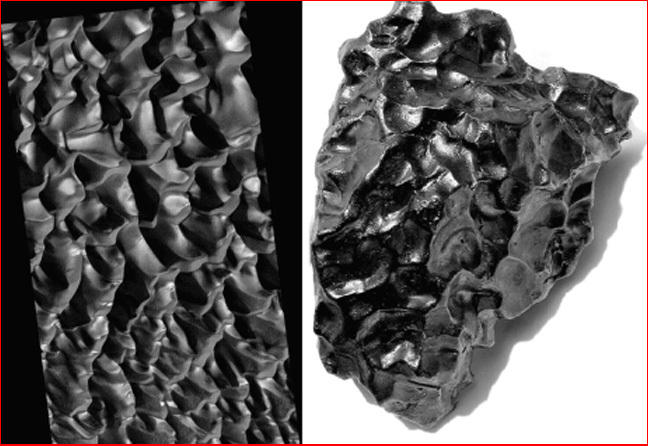 Another factor to consider is that both the "dunes" and the meteorite exhibit features that could be characterized as Von Karman Vortex Street instabilities. When electrically conductive plasma passes over a solid surface, it will sometimes form distinctive patterns that are similar to those found in fluid dynamic experiments. The plasma "sticks" to the exterior of whatever is experiencing the ion flux and carves more deeply for a few milliseconds (or minutes depending on scale), leaving the representative impression of its passage fossilized into the object or landform. It may be that the plasma acts in ways that are similar to the auroral curtains here on Earth, except that they hang low enough for their wavering, lambent flame to begin electric discharge machining (EDM) of whatever they are touching. In that same way, as a meteor makes contact with the Earth's giant electric circuit, it begins to experience plasma flow instabilities on its exterior, while the current surge penetrates the nickel-iron core. The meteor acts as a conductor for the electric fields, thus building up a huge potential as it penetrates deeper into the electromagnetic vortex of our planet. If the current flow becomes too extreme, the metallic matrix of the meteor will destabilize and the crystals will breakdown in a violent outburst of electricity. The meteor is now called a "bolide," or flaring meteor. Bolides are observed to begin their flare-ups at very high altitude, far above the atmospheric density that could possible initiate a friction-based heating and spalling of their substance. Recent announcements by Chinese investigators have confirmed that some bolides begin to glow at an altitude of 200 kilometers! By any measurement there is insufficient atmospheric density that high in the mesosphere - it is for all intents and purposes a practical vacuum, except for electrically conductive plasma. Our understanding of plasma behavior is limited to historically recent discoveries by brilliant men and women. Dr. Anthony Peratt has made significant advancements in that understanding in just the last ten years, so it should not be too surprising that the information has not been disseminated as thoroughly within the scientific community as it should. Perhaps in time, the impact of plasma dynamics will be felt and acknowledged by those who have hitched their wagons to the notion of mechanical action as the only force acting on space-borne bodies.